"I recently read your article concerning the rosary, and I want to let you know that I am a Catholic and a proud supporter of the rosary, and that I will be praying for you. You are very deceived about the rosary, and I hope that God's guidance will come to your aid. Catholics do not pray to Mary. We pray for her intercession. It's like asking a dear friend to pray for you. And who can be a better friend to us than Jesus' mother who so humbly and willingly cried out "FIAT"....May God's will be done, her whole life. We honor her because she draws us to her Son. In honoring someone's mother, you honor them in a special way. Jesus does not seek to damn those who love his mother. How can you speak ill of a mother, especially the mother of our Lord? May God bless you with every heavenly gift. Though Sara may be very sincere, the "Blessed Virgin Mary" CANNOT make intercession for her. 1st Timothy 2:5 couldn't be any clearer or to the point, Jesus Christ is the ONE MEDIATOR between God and mankind. The Catholics commit idolatry when they bow before a statue of Mary or rely upon Mary to intercede for them. As true believers in Christ, we believe that our saved loved ones are in heaven. However, they CANNOT make intercession for us. They can pray for us, but they have no special favor or power with God. A man once wrote me and said that I was wrong to teach that our loves ones in heaven could pray for us. He accused me of violating 1st Timothy 2:5. Folks, it is NOT wrong to ask someone in heaven to prayer for you. Is that not what happens here on earth every time you ask a Christian brother or sister to pray for you? Did not James advice us to call for the elders of the church when we're sick? (James 5:14). So there must be a big difference between asking someone to pray for you, verses expecting someone to reconcile things with God for you. It wouldn't be wrong for me to ask my departed mother in heaven to pray for me, anymore than it would be wrong for me to ask my pastor or a friend to pray for me. Asking someone to pray for you is very different than asking someone to intercede for you. 1st Thessalonians 5:25..."Brethren, pray for us." Was the Apostle Paul asking the church of Thessalonica to mediate for him? Of course not! Paul simply realized the power of prayer. We are supposed to pray for each other (Galatians 6:2, "Bear ye one another's burdens, and so fulfil the law of Christ"). Colossians 1:3 reads, "We give thanks to God and the Father of our Lord Jesus Christ, praying always for you." Was the Apostle Paul being arrogant? Was Paul claiming to be an intercessor? I mean, couldn't the people pray for themselves? There is nothing wrong with asking others to pray for us. Just because a loved one graduates on into glory doesn't mean that they can't pray for us. I sincerely believe that the "great cloud of witnesses" in heaven (Hebrews 12:1) are able to watch the events taking place upon the earth to a limited degree. Please read the following verse carefully, "Take heed that ye despise not one of these little ones; for I say unto you, That in heaven their angels do always behold the face of my Father which is in heaven" (Matthew 18:10). Wow! Yes, there are guardian angels assigned to each believer. The angels are continually watching the face of the Father for his next command. You had better be careful how you treat a born again Christian because their guardian angel is just waiting for God's next command. This means that we are being monitored from heaven 24/7. Scary thought huh? In light of this Biblical truth, I do believe that our loved ones (who would want to inquire about us) are allowed certain desired information. In addition, take a look at Luke 15:10..."Likewise, I say unto you, there is joy in the presence of the angels of God over one sinner that repenteth." In the presence of the angels? If the angels aren't the ones rejoicing, then who is? It can only be the saints! The context of Luke 15:10 implies clearly that the believers in heaven are aware to a certain extent of the events upon the earth. Definition of Mediate: To act between parties with a view to reconciling differences. To settle a dispute. "WHAT DOES THE MESSAGE OF FATIMA REQUEST? Folks, Mary cannot do ANYTHING to help save you! Devotion to Mary's Immaculate Heart? Roman Catholics are taught to pray to different saints to unleash certain powers and blessings. Such blasphemous teachings are nothing less than Satanic. As Christians we may ask someone to pray for us, or perhaps we may say a prayer for them...but we DON'T pray TO each other. And that's the key difference. Catholics pray "TO" the departed saints (such as Saint Anthony). I distinctly remember visiting a Hispanic Catholic man in Chicago. He had a small table behind his front door. He had several glasses on the table filled with water to varying levels. He also had a statue of Saint Anthony on the table. There was a burning candle in the midst. Each glass of water had a penny at the bottom. A string came from the display on the table and ran across the floor behind the front door. After being intrigued by his strange display, I asked him what was the purpose of such a display. The man said that he was trying to keep evil spirits from entering his home. Right down the street, there was a Catholic store for priests and Catholics. I went into the store to look at what they were selling. Inside were hundreds of charms, potions, spells, candles, and just about everything superstitious you could want to buy. As I learned more about Roman Catholicism, I found at that Catholics are very superstitious, especially in poorer countries. They burn their candles, perform their rituals, and eat feasts in honor of various saints. Surely, it wouldn't be wrong to sponsor a dinner in appreciation for a loved one, but to idolize the saints is a wicked sin!!! Catholics commit idolatry by praising and worshipping dead saints. Only Jesus is to be worshipped and praised, no one else. Roman Catholics look to the saints to make their life better, as if the Apostle Peter could do anything in heaven to help them. Folks, Jesus can hear the prayers of millions of Christians all at one time, he doesn't need any help receiving prayers. And that's really the big question...why would Catholics pray to anyone other than God Himself? Think about that for a moment? Why? I mean, did God ask anyone to pray to Mary? No, He didn't! So why do Catholics and Lutherans show such fondness to a sinful woman? Mary was a sinner just like anyone else (Romans 3:10;23). The Bible proclaims that ALL have sinned (Romans 3:10). Yet, the Catholic Church blatantly rebels against the truth by teaching their damnable lies that Mary never sinned. I triple-dog dare you to show me that anywhere from the Word of God! You CANNOT! The Catholic religion is NOT infallible! Catholics are confused. They practice false worship. In conclusion, Mary is NO mediator or intercessor...she is just a woman. No dead saint or living Pope can mediate for you. Though Catholics claim they are only honoring the dead saints and Mary, the truth of the matter is that they are obsessed with wicked idol worship. This is why the 2nd of the Ten Commandments is missing in their Catechism books. No saint or priest can reconcile your sinful heart to God. 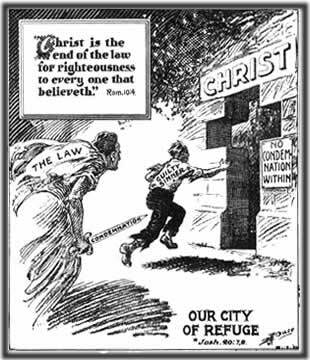 The ONLY way to obtain the righteousness of God is in Jesus Christ (2nd Corinthians 5:17). There is only ONE MEDIATOR...Jesus Christ!